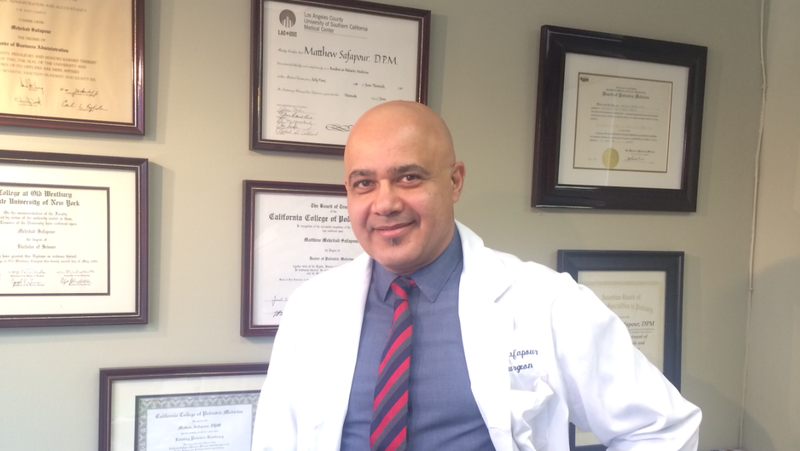 "TOP DOCTORS LIST OF LOS ANGELES MAGAZINE 2018"
TOP FOOT SURGEON IN LOS ANGLES, ACCORDING TO LOS ANGELES MAGAZINE SURVEY. We Provide Treatment For: Achilles Tendonitis, Allergic Contact Dermatitis , Athlete's Foot, Brachymetatarsia, Bunions, Calluses, Diabetic Foot Care, Flatfoot (Fallen Arches), Ganglions, Haglund's Deformity, Hallux Rigidus, Hammertoes, Heel Pain/Fasciitis, Infections, Injuries, Ingrown Toenails, Metatarsalgia, Morton's Neuroma, Onychomycosis, Osteoarthritis, Pediatric Foot Care, Plantar Warts, Plantar Fasciitis, Posterior Tibial Dysfunction, Rheumatoid Arthritis, Running Injuries, Sesamoiditis, Sprains/Strains, Tarsal Tunnel Syndrome, Tailor's Bunion, Tendonitis, Toe Deformities, Xerosis, Podiatrist, Foot Doctor. If you would like to request an appointment for a future day and time.